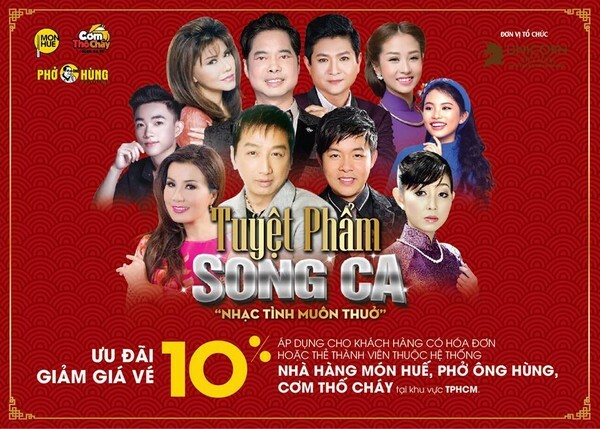 Concert Duet Masterpieces - "IMMORTAL LOVE SONGS" with the participation of the well-known Vietnamese and overseas Vietnamese singers. * Mon Hue Restaurant is pleasure to accompany with this concert. * For customers who have bills or Membership card from Mon Hue , Pho Ong Hung, Com Tho Chay restaurants in HCM City. * The concert is at 20.00pm, May 14th 2017 at Hoa Binh Theater. * Quickly purchase ticket to guarantee your spot!